India and Pakistan, still at loggerheads on Kashmir and no closer to a full peace deal, are channeling their efforts into increasing trade in the hope that business can bring them together. 31-year-old Karachi food trader Kashif Gul Memom is among those eager to seize the opportunities offered by easier links between the estranged neighbours, which have fought three wars since independence in 1947. “This is a change for the good. It’s an exciting time,” said Memom, one of the generation born after the painful partition of the subcontinent that gave birth to India and the Islamic republic of Pakistan. “My generation of business people is putting the past behind us. We’re looking to the future, India is such a huge market for us,” Memom told AFP while at the largest ever Pakistani trade fair held in India. The improved relations between the nuclear-armed rivals stem from Pakistan’s decision to grant India “Most Favoured Nation (MFN)” status by year end, meaning Indian exports will be treated the same as those from other nations. In further progress, the neighbours opened a second trading gate in April along their heavily militarised border, boosting the number of trucks able to cross daily to 600 from 150. India now also says it is ready to end a ban on investment from Pakistan and the countries are planning to allow multiple-entry business visas to spur exchanges — a key demand by company executives. The warming commercial ties underline the new relevance of the private sector in the peace process, with prospects still low for any swift settlement of the “core issue” of the nations’ competing claims to Kashmir. The divided Himalayan territory has been the trigger of two of their three wars since independence. Indian and Pakistani officials have been looking at the so-called “China option” as a model, with deepening economic engagement seen by experts as crucial to establishing lasting peace in the troubled region. Beijing and New Delhi have been pursuing stronger economic ties while resolving outstanding political issues, such as a festering border dispute that erupted into a brief, bloody war in the 1960s. “There is no other option but economic partnership between India and Pakistan — this leads on to other partnerships,” Indian Commerce Minister Anand Sharma said at the April trade fair in Delhi, a follow-on to a similar venture in Lahore earlier in the year. Some Pakistani businesses have protested against the trade opening, fearing they may be swamped by cheaper Indian goods, especially in drugs, auto parts and consumer goods. But others eye the possibilities India’s market offers. “India with 1.2 billion people gives us great potential,” Mian Ahad, one of Pakistan’s leading furniture designers, told AFP. Indian businessmen are equally enthusiastic, saying there is an opportunity for trade in areas from agriculture, information technology, pharmaceuticals, and engineering to chemicals. 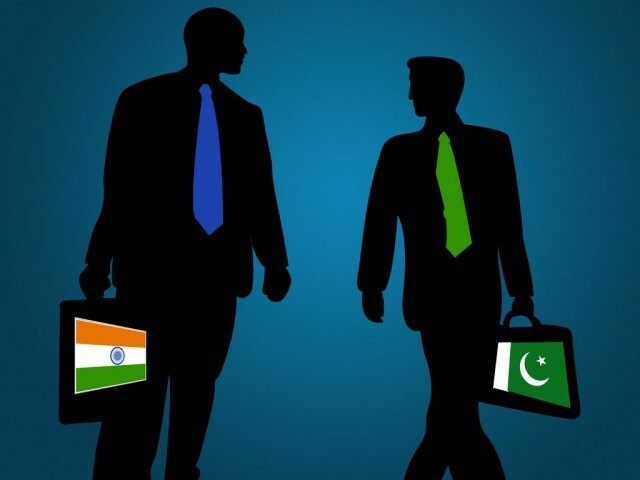 Official bilateral trade between India and Pakistan is just $2.7 billion and heavily tilted in New Delhi’s favour. But Indian business chamber Assocham estimates up to $10 billion worth of goods are routed illicitly — carried by donkeys through Afghanistan or shipped by container from Singapore and the Gulf. MFN status will mean India can export 6,800 items to Pakistan, up from around 2,000 at present, and the countries aim to boost bilateral trade to $6 billion within three years. “I’m cautiously optimistic. Commerce is an excellent way to bring countries together,” Indian strategic analyst Uday Bhaskar told AFP.